It's my favorite kind of Sunday-- rainy. Outside, birds are twittering, and inside, I'm puttering around in my pajamas, chatting with the cats and indulging in my new obsession, needle felting. I'm so glad I took that class at Stitches! The instructor, Debbie Radtke, who designed these charming hedgehogs, made it fun and stress-free. 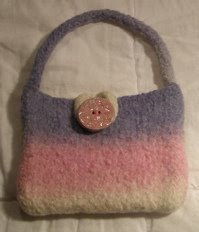 She encouraged us to experiment and play with the needle felting, likening it to finger painting. I pulled this felted PDA case out of my drawer last night and got to work. I made it a few years ago based on a pattern from Leigh Radford's Alterknits, but I felted it too much-- it turned out too thick and too tiny, which is why it was stuffed away in a drawer with my other knitting mishaps. But the needle felting has breathed new life into it. The ceramic button is the work of Carol Milich. I adore her buttons! Here are a few more I bought at an antique store in Boulder Creek last summer. I also worked on the Kureyon bag last night. First, I decided to line it. I bought some cotton fabric at Joann's , but I don't know how to sew, so I had to turn to my handy-dandy Girl's Best Book of Knitting, Sewing and Embroidery for guidance. I'm glad you can't examine my stitches closely because they are rather awful. But I did manage to line the bag. Then I attached a leather handle I bought at Stitches on Friday. These handles are kinda different-- the buttons really do go on the inside of the bag. The bag has a million imperfections, but that's okay. It'll work as a shopping tote or a book bag. And at least I got to practice my sewing skills. Thanks Dogwood! If wasn't for you, I never would have learned to knit. Your enthusiasm is what got me started, and you continue to inspire me with your creativity and generosity. I wish I could quilt and scrapbook like you ... we do need to spend some time together!